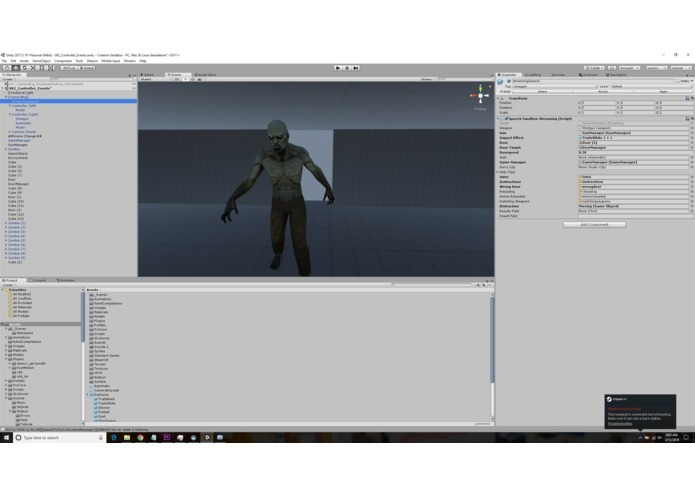 A virtual reality game that uses voice commands to interact with an "Artificial Intelligence"
Player can interact with an "Artificial Intelligence" in Unity, player can tell the AI to switch weapons, reload weapons, and more. Getting voice commands to register. IBM Watson provides 100 minutes of free use for the speech to text services. I ended up going over this limit and this caused our services to be cancelled and broke our entire project. I had to call IBM this morning and they didn't offer ended up. Another team member had to sign up for Watson services and we had to change the credentials to our scripts.